Limits of Power for Sale! 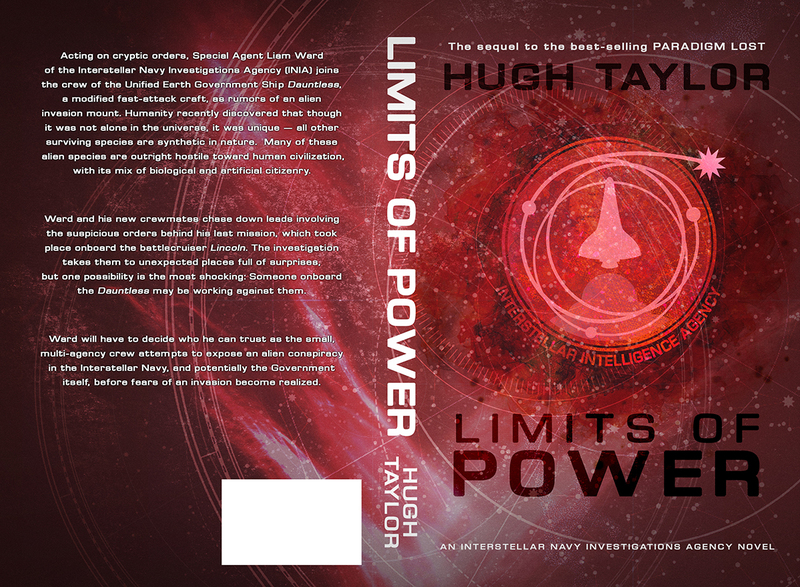 Limits of Power, the second book in the Interstellar Navy Investigations Agency series and the sequel to Paradigm Lost, is now for sale on Amazon! The paperback version officially launched on November 11, 2015, and the e-book version is available for pre-sale until November 19, when it goes live. If you purchase the hard-copy, then the e-book can be ordered for an additional $0.99 via Amazon’s Matchbook program. Otherwise, the e-book is $4.99 or free to read with Kindle Unlimited. If you haven’t read Paradigm Lost yet, the deals are the same on Amazon! Book 3, currently untitled, is under development. I don’t have a firm timeline for this one, though it will definitely launch in 2016. I also have vague frameworks for Books 4 & 5, so I should be able to provide a rough ETA on Book 4 once Book 3 gets into editing. This entry was posted in Uncategorized on 2015-11-14 by HughTaylorSciFi. The cover is here, thanks to Dave Mickolas of Universal Book Covers! The book should be available for pre-sale by Halloween in both paperback and e-book formats. This entry was posted in Uncategorized on 2015-10-24 by HughTaylorSciFi. I have a draft of the cover for Limits of Power, which I really like. It’ll be ready to share after a few little tweaks. Book 3 is actually coming along well already, too. I don’t have a schedule for it, but I’m making more progress than I anticipated. Though, I will have to take a break from it when LoP comes out of editing. I still hope to have it available for pre-sale by Halloween! This entry was posted in Uncategorized on 2015-10-17 by HughTaylorSciFi. I finally settled on a title for the sequel to Paradigm Lost, which will be Limits of Power. I’m putting the final pre-editing touches on it over the next few days. I admit, I had some concerns about this book at first; but it’s really coming together the way that I wanted it to, and I think that if you enjoyed PL, you’ll enjoy this too. I won’t have an official release date until it’s out of editing, but I expect it to be available for pre-sale around Halloween and for sale before Thanksgiving, in both digital and paperback formats. The cover art might follow soon; I’ll post that as soon as I have it. Again, thanks for reading! This entry was posted in Uncategorized on 2015-09-27 by HughTaylorSciFi. Words have been written. I didn’t intend to start so soon, but I couldn’t help myself. I have no idea what the timeline will be on this one, since I’m still in the editing phases of Book 2 (which also still needs a title) and I decided to finish a Computer Science degree over the next two years, also on the side. Not to mention, I like to spend time with my family when I’m both home and conscious, and my sweetheart of a Rottweiler mix is guilting me right this very second. I also want to do a little bit more research for some aspects of Book 3. The good news is that, basically by the time I was done with Chapter 2 of the sequel, I already knew what I wanted to do with Book 3. So I’ve had plenty of time to think about it and I definitely know where it’s going, which usually means the book gets written faster. Though, with 1.926 books to my name, I don’t exactly have a large basis for comparison. This entry was posted in Uncategorized on 2015-09-22 by HughTaylorSciFi. I just finished the draft of Book 2, which is now in its final ‘pre-editing’ stage. It will go to Monique Happy Editorial Services at the end of the month and should be available for pre-sale by the end of October, with a launch date right before Thanksgiving. I can’t wait, and I hope you like it! This entry was posted in Uncategorized on 2015-09-19 by HughTaylorSciFi. I had to push my Book 2 dates back about a month, but I am back in the swing of things and making good progress. I’m hoping to have it available for pre-sale on Amazon in late October of this year, with it going on sale around Thanksgiving. There should also be a paperback version available from Day 1 for those of you who prefer that format (and for a small additional fee, I believe you can have both versions). I still don’t have a title for it (I’m actually horrible at naming things for some reason), but it’s been really fun to write so far. I hope you enjoy the ride! This entry was posted in Uncategorized on 2015-08-23 by HughTaylorSciFi.